Every day, we wake up to face the cruel realities of a world driven to ruin by overconsumption and powerful men’s self-absorbed disregard for the rest of us. We all find ways to overcome the internal crises that come with being alive in 2019, finding solace in moments that make us believe that there is a better way than what our existences have been allowed to become. This Lionel Messi pass is one of those moments. With one perfectly weighted through ball, Messi carves up more than half of the entire Getafe team, with a whopping six defenders taken out of the play at the same time. Light a candle specifically for Djené Dakonam, who thinks he has the ball covered until the last possible instant, when he realizes that it was never going the way years of training had taught him it would be. That’s because, when the ball is hit, it looks like Messi is trying to force it into Luis Suarez through the first two defenders—as any other player would likely do in the same situation. Lionel Messi doesn’t force anything, though. Instead, he drags the Azulones defense towards his ever-dangerous left foot before hitting the ball across his body to an open space that existed only in the far reaches of his mind. 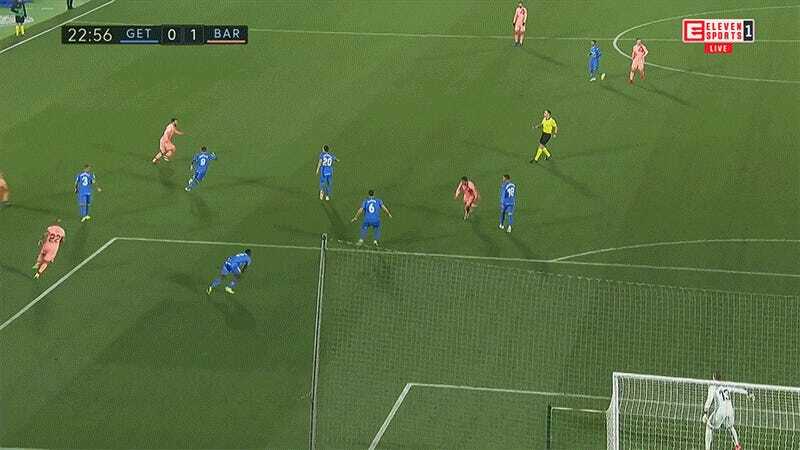 Though it didn’t lead to a goal or contribute a meaningful statistic towards Barcelona’s 2-1 victory over Getafe, there has perhaps never been a better argument for watching every second of every Messi game than this pass. He will soon retire, leaving behind the pitches of Europe, where he rose from a boy with a growth hormone deficiency to living proof that aliens are among us. We should all appreciate the time we have left to watch him ply his craft, because there’s probably no one else on Earth who even thinks to make this pass, never mind actually do it in a way that creates a chance. Of all of the developments in Messi’s career—bringing about the rise of the false nine, training his right foot to not be a weakness, becoming a free-kick savant—there is none more spectacular than the greatest goalscorer the world has ever known also becoming one of the best passers in history. It should not be fair that Messi can put the ball anywhere he wants, from his long, winding cross-field lobs to nutmeg assists where no angle was thought possible. It was already impossible to defend him when he could either score from every angle or dribble the ball into the goal, but now you’ve got to watch out for passes that warp what soccer has become over the last century. Good luck. Will we remember this pass in a month? Maybe not; after all, I had already forgotten that he had a hat trick and two assists in a single game against Levante last month. That’s a career game for most players, and yet it’s just another Messi performance that you happen to remember and say, “Oh yeah, that was pretty good.” In the moment, though, Messi rewards you for paying attention, for going out of your way to let him entertain you.